Winnipeg Jets goaltender Connor Hellebuyck started just one of three games on the team’s west coast swing this week, and that was by design. 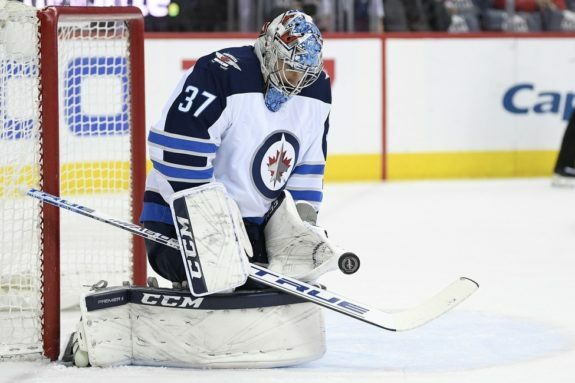 It was a decision to ease Hellebuyck’s burden in preparation for the start of what the Jets are hoping will be a long playoff run in a couple of weeks. However, despite not being scheduled to see any action Thursday night as the team took on the Vegas Golden Knights, Hellebuyck was thrust back into the crease in the mid-second after Laurent Brossoit pulled himself due to an lower-body injury he appeared to sustain when Cody Eakin crashed the net in the dying seconds of the first. That led the Jets to call-up Eric Comrie from the Manitoba Moose on Friday. #NHLJets have recalled goaltender Eric Comrie from the @ManitobaMoose under emergency conditions. The Jets have reassigned goaltender Ken Appleby from the @JaxIcemen of the ECHL to the Manitoba Moose of the AHL. How long Brossoit will be out for is not yet known. However, even if Comrie is behind Hellebuyck instead of Brossoit for the rest of the season, the Jets should still stick to their strategy of giving Hellebuyck some time off down the stretch. If you’re concerned that limiting Hellebuyck’s starts for the rest of the regular season will render him rusty come Round One, fear not. The 25-year-old goaltender has started 55 games this season, and after his relief appearance in Vegas, has appeared in 56. He’s faced 1,808 shots, more than any other goalie in the league. While it’s true Hellebuyck’s had some rough patches this season and his numbers — a 2.93 goals-against average (GAA), a .912 save percentage (SV%) and one shutout — are far from the ones he posted in his outstanding 2017-18 Vezina-nominated campaign (an award this writer still staunchly believes he should have won instead of Pekka Rinne), giving him a heavy workload down the stretch won’t fix his issues. There are other factors that underlie Hellebuyck’s regression anyhow: scoring chances are way up across the league this season and the Jets defense corps have allowed a higher number of high-danger scoring chances at all strengths per game this season (11.64 per game) than they did last season (10.23 per game). Rest could only do him good. He likely wouldn’t admit it, but he’s probably feeling the fatigue that every NHLer feels at the tail end of an arduous 82-game schedule. If anything, rest will help him refocus and get ready for the importance of what’s on the horizon. Brossoit’s play this season made employing a true tandem — alternating the two ‘tenders between now and the end of the season on April 6 — a no-brainer. Brossoit is one of the league’s best backups and there’s really no drop off in the Jets’ chances of winning when he draws a starting assignment. Laurent Brossoit has proven himself to be a cool, calm, and collected competitor in his first season with the Jets. He’s arguably the best backup in the league, and gives the Jets just as good a chance to win as Hellebuyck does. The 25-year-old goaltender — whose chances of being a full-time NHLer seemed to be slipping away at this time last season — has put together a stellar campaign that will likely attract offseason suitors looking to shore up their puck-stopping problems. Even after allowing three goals in the Jets’ listless Thursday night effort, Brossoit is still 13-6-2 this season with a 2.52 GAA, a.925 SV% and one shutout. He’s been excellent in high-volume games — he’s faced 35-plus shots in 10 of his starts this season and is 9-0-1 in when he does. Comrie may not have the same skill as Brossoit, but the 23-year-old has been a workhorse for the Moose this season. He’s posted a 23-16-2 record in 45 games along with a 2.75 GAA, a .916 SV% and a pair of shutouts. The Moose are still in the conversation for a Calder Cup Playoff spot in the AHL’s Central Division with less than a month to go. The fact they’re not dead-last given how transient they were at times this season is testament mostly to Comrie’s rock-steady play; play he can hopefully translate to the NHL level. 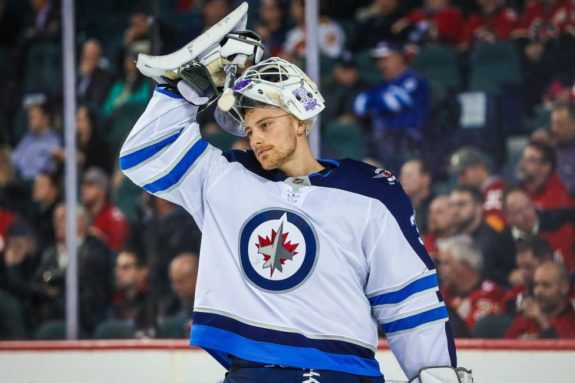 While it’s true Comrie has made just four career NHL starts and represents a downgrade from Brossoit, making sure Hellebuyck is rejuvenated come playoff time should supersede any concerns that starting Comrie might prevent the Jets from winning the Central Division. Finishing first in the Central — while undeniably nice — isn’t the end-all-be-all and won’t lead to a playoff cakewalk, anyhow. 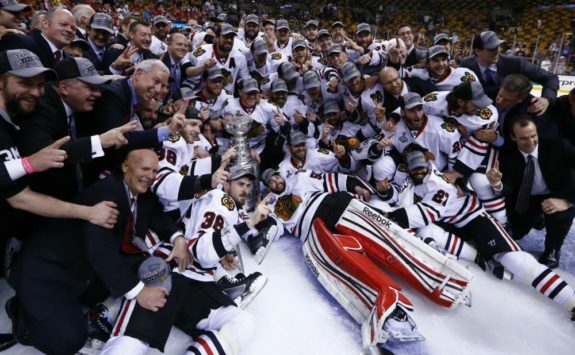 The last time a Central Division champion hoisted Lord Stanley’s Mug was in the lockout-shortened 2012-13 season when the Chicago Blackhawks captured 77 points, the Presidents’ Trophy and eventually the Cup in six games over the Boston Bruins. The Jets are leading the Central right now with 92 points, two ahead of the Nashville Predators with a game in-hand. If the playoffs started today, they would face the Dallas Stars. If the playoffs started today and the Jets were in second instead of first, they’d square off against the St. Louis Blues. Both teams are tough and neither is a “lesser” opponent. The Jets will have to bring their A-game regardless. We won’t know the extent of Brossoit’s injury until Saturday afternoon, after the Jets’ skate, and before they face the Predators on Saturday evening. Even if he turns out to be out for a while, the Jets should still employ a tandem and give Comrie some starts. The game against the Predators will likely go to Hellebuyck. After that, the Jets have eight more games and should give Comrie — or Brossoit, if his injury is minor — the crease for four of them. Even though having Comrie instead of Brossoit as the backup would make the situation more complicated, the decision to stable their starter so he’s ready to burst out of the gate at the beginning of a Cup chase is undoubtedly still the right one, regardless of the backup.